Two Emily flying boats (W45 and W46) captained by Asai and Mizukura left Rabaul at 4.18 pm on 25 July 1942 and arrived in the Townsville area from the north east at about 11.30pm and circled the city watching the bright lights on the wharves and in the city area. It took over half an hour before the military presence in Townsville realised there may be problems. The lights went off and four searchlights threaded the sky looking for the two aircraft. They eventually spotted the aircraft, but lost them when they headed out to sea. The two flying boats returned at 12.40am and dropped 15 of their 250 kg bombs near the Townsville wharves where three vessels were berthed. They were believed to be the SS Bantam, SS Burwah and the HMAS Swan. Six bombs were seen falling into the sea about 200 metres from the main jetties. The two Emilys arrived back in Rabaul at 7.12 am the next day. The military in Townsville signalled 76 Squadron RAAF based at Milne Bay in New Guinea in an attempt to attack the Emilys on their return to Rabaul. Unfortunately their takeoff was delayed by an hour and their planned attack never happened. Two ships, HMAS Swan and SS Time had a minor collision at about 2.10 am as they exited the harbour in haste. A small group of prison warders from Stuart Prison were were playing a game of cards at home at the time of the raid. They heard some loud bumps in the distance and felt the ground shake slightly. At the time they had no idea that Townsville had been attacked by the Japanese. They heard about it in the news the next morning. Slit trenches were hurriedly dug in back yards for use during any further alerts. Off-duty warders were instructed to report for duty at the prison should they hear an air raid alert. lights visible in town area. 0010hrs 2310hrs Caught in beams of four search lights. 0015hrs 2315hrs Escape to sea. 0040hrs 2340hrs Bombed jetty and three large merchant ships. 0712hrs 0612hrs Doors open Rabaul. "A Japanese Flying Boat came over one night, no higher than 10-11,000 feet. 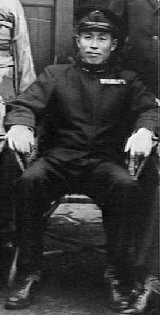 The radar people picked him up, and eventually had him right over Garbutt Airfield, but the Commanding Officer, Colonel Meyer, forbade the batteries not to fire "For fear of giving away our positions!!!". "I saw the bomber that night, trapped like a butterfly in the lights, which suddenly went out." "The Commanding Officer was immediately relieved of his duties and shipped home the next day, but the event was not forgotten by our Aussie Cobbers who going around with us at Barth's pub." "We would do the buying, because the Aussie pay of 9 shillings per day did no last too long--not the way they slurped it down!" Air Raid Wardens from South Townsville reported that one of the bombs in this first Japanese bombing raid on Townsville had not exploded. The 2nd and 3rd sections of a Bomb Disposal Company under Lieutenant Colin Ian Gladstone Huxley (QX38303), with Sapper Frederick Van Doorn (QX29768), Sapper Mens and Corporal Smith, were sent to investigate the report. The 6 bombs were dropped on the eastern side of the harbour about 200 metres from the main jetties. 28 July 1942 No! They aren't standing on a submarine in Cleveland Bay! 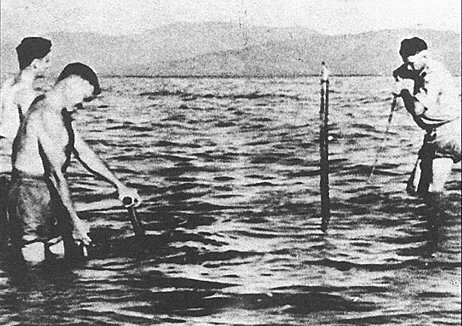 It's an Australian Army team attempting to recover an unexploded 500 lbs bomb from shallow waters in the harbour following a raid by the Japanese. I'd like to thank Minoru Kamada for his assistance with this web page. "The Hidden Chapters, Untold stories of Australians at war in the Pacific"